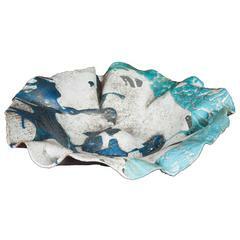 This one-of-a-kind decorative dish by Minh Singer is hand-built from stoneware with bits of mica incorporated into the clay body and then raku fired with a horsehair finish. Can be used as a decorative vide poche. Horse hair raku is a method of decorating pottery through the application of horsehair to the heated piece. The hair burns to create smoke patterns and carbon trails on the surface of the work. Measures: 7” x 7.25” x 2” For decorative use only - not food safe. 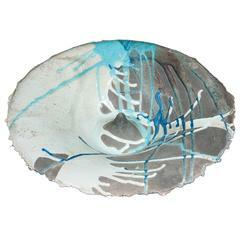 Minh Singer is a ceramic artist based in Brooklyn by way of Ho Chi Minh City, Los Angeles, and Hong Kong. Minh approaches each piece as a meditative journey, mindful of our humanity and beautiful imperfections. Inspired by the unpredictability of nature and of civilizations long gone, her work is a collection of mystical objects from an unknown past. Singer's prism series was on view at the Brooklyn Museum as part of the Greenpoint Hill collection at the 2018 Brooklyn Designs show, and her work has been featured in publications nationally and internationally, including Harper's Bazaar, Japan. Singer is a graduate of Pratt Institute and has worked in fashion and art education. Eine auffällige kleine dänische moderne dekorative Glasschale. Glas ist klar mit einer schwachen himmelblauen Farbe. 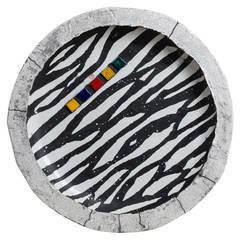 Dekorative Raku breite Keramikschale. Hergestellt in Deutschland Guter Vintage Zustand.